Carlos "Trip" Costas was a member of the elite level traveling baseball team, the Las Vegas Roadrunners. They were playing the Boise Bulls and while Danny was making the pitcher work, Trip was pushing his luck by taking a long lead and got picked off by the catcher for the final out of the inning. That wasn't the last of it because Trip's dad, Julio, came bombing onto the field trying to bust his chops. "What were you thinking? You had that guy! You could steal standing up!" Who cared. The umps had to break them up before things came to blows. Crazy Julio Costas was at it again. Julio was a famous Venzuelan singer who once had aspirations of becoming a baseball great, but was discovered singing on a street corner. Instead, he passed his dreams onto his sons, especially Trip because he had the talent. Twelve years of pushing baseball down his throat was enough for the sixteen-year-old and he'd just about had it. There had to be more than shagging flies in practice waiting for some major-league scout to notice him. Heck, the only real thing about baseball was its "dependability, repetition, and routine" and Trip was sick of it. Coach Harris and his assistant, Coach Washington, noticed that Trip was messing up, but when Julio threatened to quit funding the team they all had problems. Trip's dad seemed to be putting his nose where it didn't belong and they all were being forced to go along for the ride. One thing that Trip really liked to do was sing and lately that was the only thing that kept him going. When he played in his band, he sang one of his father's songs, "The Dream I Left Behind." Was Trip going to leave his dream of singing behind or was he going to follow his father's and become a baseball player? This is the mesmerizing story of Trip, a young man who has to choose between two dreams. Of course one of them is his own, while the other one is that of his father, Julio, a man who is living vicariously through his son. The story picks up Trip's emotional quandary perfectly, but doesn't make it into a downer. Many young people get discouraged when their parents or others have high expectations of them, expectations that may not mesh with what they want. Trip is just one of several players on the Roadrunners who is experiencing a personal problem of one sort or another. 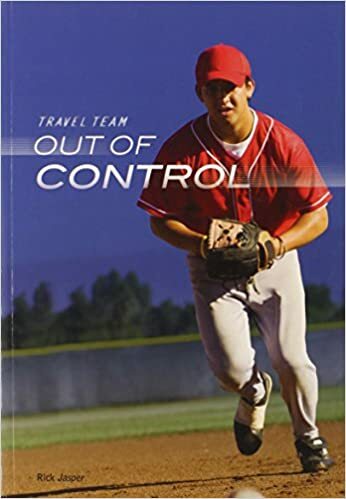 I've read three in the "Travel Team" baseball collection and have enjoyed them all. Quill says: This series, for ages 9 to 12, is `all baseball' and will interest not only the die-hard fan, but also the reluctant reader.